Bishkek: Moscow can see Western countries’ reluctance to communicate on equal footing on various platforms but is calm about it, Russian Foreign Minister Sergey Lavrov said at Kyrgyz-Russian Slavic University. 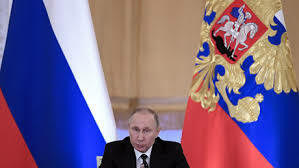 According to him, Russia calls for building contacts between the Eurasian Economic Commission and the European Commission, as well as between the Commonwealth of Independent States (CIS) and the European Union, the Collective Security Treaty Organization (CSTO) and NATO. “We can see that our Western colleagues are reluctant to communicate on equal footing on various platforms,” he said. “We are calm about it. Arrogance and a sense of superiority never made anyone more attractive,” Lavrov noted. “There will come a time when life will put everything in its place,” the Russian top diplomat added.